No master toolholder has been defined for the initial state ($MC_TOOL_MANAGEMENT_TOOLHOLDER = 0), therefore no toolholder is available. The NC command SETMTH has neither been defined. In this setting, the tool change is carried out referring to the master spindle. The master spindle is set with SETMS. 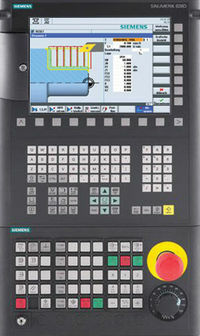 Correct the NC program (delete or replace SETMHT) or enable toolholder function via machine data.